A Darjeeling Himalayan Railway or the Toy Train engine derailed near Tung this morning, making it the third toy train locomotive to skid off the tracks in the past three days. No one was injured in today's accident. On January 26, a tourist from Calcutta died when the toy train from Siliguri to Gayabari in Kurseong subdivision hurtled downhill. The deceased, Moly Pal, 51, had jumped off the moving train to save herself. Yesterday, the engine of an empty train derailed near Tung, 30km from here, on the Kurseong-Darjeeling stretch. The diesel locomotive that jumped tracks today, also on the Kurseong-Darjeeling route, around 7.45am was pulling three empty coaches. "The loco did derail but there were no passengers in the train. A train on the same route had derailed yesterday," said a DHR source. 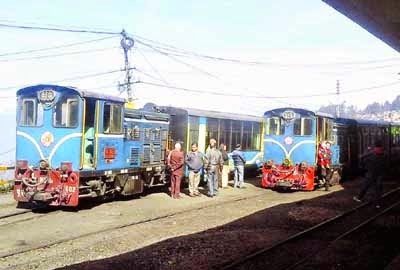 The Kurseong-Darjeeling train leaves Kurseong at 7am and is scheduled to reach Darjeeling station at 9.40am. The evening train from Darjeeling leaves at 4pm and reaches Kurseong around 6pm. Most tourists who put up in Darjeeling avoid the early morning and evening trips and prefer the Darjeeling-Ghum-Darjeeling DHR rides instead. Local people avoid toy trains as vehicles take nearly half the time to cover the same distance. S. Lahiri, the chief public relations officer of the Northeast Frontier Railway, said: "We are investigating the incident. Every derailment in the country is investigated and it will take a few days before the reports come." Although DHR records were not found immediately, toy train derailment is not uncommon. Between 2008-2009, there have been as many as five derailments in a single month, sources said. Major accidents have not been reported. Sources in the DHR said toy trains travel at an average speed of 15-20kmph in the hills. "There are seven-eight staff members in the trains always. In most cases, they are able to put the coaches back on the tracks. Generally, the passengers just hear a thud," said a source in the DHR. On January 26, a toy train carrying more than 50 tourists hurtled down a slope in Kurseong killing a lady. A Siliguri-based businessman had turned the emergency brake as several passengers and a guard jumped off the moving train. Three others were injured in the accident. Yesterday, a railway official had said the wheels had slipped on the tracks. "There was some slipping of wheels on the tracks when the train was travelling downhill. This happens when brakes are applied forcefully in a moving train.. An inquiry committee will investigate the incident," A.K. Sharma, divisional manager (Katihar division) of the Northeast Frontier Railway, has said. A DHR coach weighs around 5 tonnes and the engine weighs around 17 tonnes. Today, Lahiri said the number of derailments have come down over the past few years. "The (hilly) terrain is difficult but after every derailment, we take corrective measures. Over the years, such incidents have come down," he said. "We conduct maintenance regularly, which also includes preventive maintenance. Moreover, every (damaged) part of the DHR is replaceable." The DHR is running since 1881 and was accorded the world heritage status by Unesco in 1999. Diesel engines were introduced around 20 years ago. DHR sources said replacement of wooden sleepers with concrete ones between 2002-2006 have brought down the number of derailments. Darjeeling Himalayan Railway or the Toy Train engine derailed near Tung this morning, making it the third toy train locomotive to skid off the tracks in the past three days.